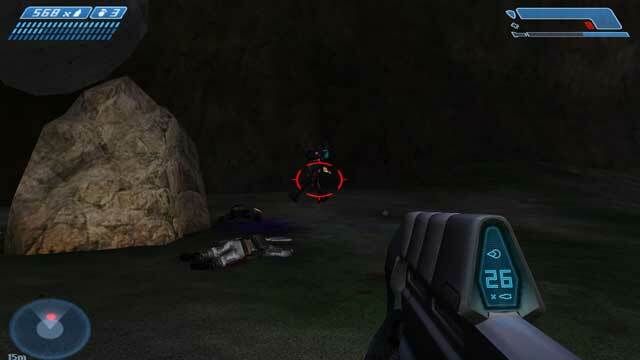 Halo: Combat Evolved 1 is a first-person action game or FPS (First Person Shooter). Its franchise has become one of the most famous of the last years, and this title starts the saga, which was initially available on Xbox, the Microsoft console, and now it is also available on PC. This demo version lets us try “The Silent Cartographer” mission, where we have to destroy our enemies after disembarking on a coastal beach. We will have a gun, a rifle and grenades, and we can also collect weapons of the defeated enemies. For starting to know how to play Halo, we fist have to choose “Campaign” option for starting the campaign, which refers to the 4th mission of the complete game. We can choose the difficulty of 4 different levels: Easy, Normal for rising the difficulty a bit, Heroic for doing really difficult things and Legendary for the most experienced players. Now the game will start, showing us an intro video of the arrival to the island where the battle is going to take place. It is very easy to manage the game, we will move with WASD keys and point using the mouse. Left mouse button is for shooting and the right one is for throwing grenades. Tab key serves for changing weapons, while space bar makes us jump. We can see the amount of bullets left on the main weapons screen, and for recharging it we just need to press R key. When we are using other alien weapons, in case of needing to recharge, we just have to wait for them to cool down and then they will be again ready to shoot. From here on it’s you who has to follow the adventure and destroy all the enemies managing the Great Boss, the main character of the story. After trying to play this game for some minutes and seeing how to play the game, we realize that it’s very easy to control. With no doubt, this is one of the features that have made Halo and all its sequels reference for the majority of games of this kind.